Not trending: Prices can move sideways for long periods of time while the market makes up its mind what to do next (congestion). In that instance, the moving average is a horizontal line. You get no buy/sell guidance from moving average techniques in a sideways move like the one shown in this figure. 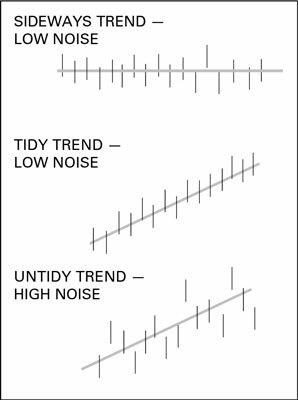 Noisy: A price series that has many prices that vary far from the moving average is said to have a lot of noise, likening outliers to the static you get on a car radio when you move out of signal range. The second chart in this figure shows a tidy trend, with few outliers. 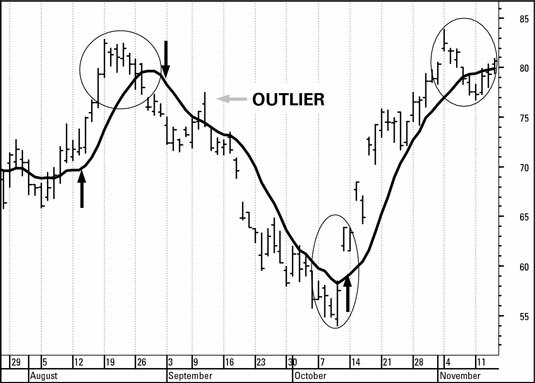 The third chart is the same moving average, but it arises from a price move with many outliers. You can’t do anything about a sideways move (except perhaps trade the security on a shorter time frame that may contain minitrends). But you can do something about noise — apply a moving average with more days in it. You want to minimize losses, and a noisy price series makes you vulnerable to false buy/sell signals. When you use a higher number of days in the moving average, noisy outliers get put in their place, arithmetically speaking. An abnormally high or low price relative to the existing average is less important in a 50-day moving average than in a 10-day moving average because it literally carries less weight in the calculation. But, in some periods, the security is tidy, and in other periods, it’s noisy — and you don’t know in advance which it is going to be. Fixing noise by altering the number of periods in the moving average is an endless challenge that has launched a gazillion hours of research. Because new data comes along all the time, a lot of this noise-targeting research is wasted. Often, you can see a dramatic price move, but you know it’s going to take days for the moving average to catch up. You’re disciplined and committed to following the crossover rule, but potential profits are going up the chimney while you impatiently wait. Why not simply reduce the number of days in the moving average? A short moving average is more sensitive to recent prices. As a general rule, you want to use as few days in the moving average as possible without running into a high level of wrong signals. When you use a very short moving average, like three days, you not only lose the descriptive visual power of the line on the chart, but you also get a lot of whipsaws. In fact, using a 3-day moving average on the same data in this figure cuts the profitability to under 5 percent — worse than if you used the buy-and-hold approach. No single number of days is best for a moving average. The best number is the one that fits how noisy the prices are. If your prices are so noisy that you would have to use a high number of days in the moving average, resign yourself to getting late exits long after the price peak. Or you can find a different, more orderly security to trade.